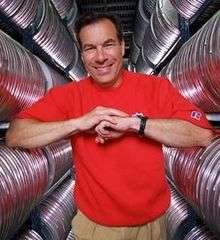 Stephen Douglas "Steve" Sabol (October 2, 1942 – September 18, 2012) was an American filmmaker. He was the president and one of the founders of NFL Films, along with his father Ed. He was also a widely exhibited visual artist. Sabol was born in Moorestown, New Jersey and attended Colorado College, where he played football and was a member of the Kappa Sigma fraternity. He was the subject of a humorous article about his self-promotion exploits in the November 22, 1965, issue of Sports Illustrated. He began working at NFL Films as a cameraman alongside his father Ed Sabol (1916–2015) after graduation. He started in the filming industry when his father got the rights to the 1962 NFL Championship Game, played in Yankee Stadium on December 30. This company eventually grew into NFL Films, with Sabol serving mainly as a cameraman, editor, and writer in the 1960s and 1970s. When ESPN was founded 1979, they soon signed NFL Films as a production company and Sabol became an on-air personality in the 1980s. He won 35 Emmy Awards and had a documentary about him air on 60 Minutes. Sabol played a part in founding the NFL Network. Sabol was the author of the poem "The Autumn Wind", later adopted by the Oakland Raiders as an unofficial anthem. As president of the most honored filmmaker in sports, Sabol continued to be the artistic vision behind the studio that revolutionized the way America watches football. Sabol and his father, Ed, who was elected to the Pro Football Hall of Fame on February 5, 2011, were honored in 2003 with the Lifetime Achievement Emmy from the National Academy of Television Arts and Sciences for "revolutionizing the way America watches football and setting the standard in sports filmmaking." While NFL Films has won over 100 Emmys, Sabol himself has received 35 of those Emmys for writing, cinematography, editing, directing, and producing. No one else in all of television has earned as many Emmys in as many different categories. Building on the entrepreneurial spirit of his father and founder of NFL Films, Sabol was named the 2002 Sports Executive of the Year by Sporting News magazine. Sabol also received the prestigious Pete Rozelle Award, which is presented each year to someone who has made an outstanding contribution to the National Football League and to professional football. He joins a select group of honorees including: Vince Lombardi, Dan Rooney, Lamar Hunt, Tom Landry, and Don Shula. In 2007, the Pro Football Hall of Fame honored Sabol with the Dan Reeves Pioneer Award recognizing his innovative ideas that have contributed to the game of professional football. Sabol was the recipient of the 2010 Sports Leadership Award presented to him at the March of Dimes 27th Annual Sports Luncheon, which is one of the highest profile events of the year for the sports and sports media business in New York. In March 2011, NFL Films was recognized with the Lamar Hunt Award for Professional Football, which is given in recognition of visionary leadership that has helped the NFL become the preeminent pro sports league in America. Sabol and his father, Ed, were inducted into the Philadelphia Sports Hall of Fame in November 2011, which was followed by Sabol's induction into the Sports Broadcasting Hall of Fame in December. Sabol received the Sports Business Journal's "Champions – Pioneers & Innovators in Sports Business" award in March 2012 for shaping the business of sports through his career of distinguished success. Sabol began his career in 1964 as a cinematographer working for his father and founder of NFL Films, Ed Sabol. As an All-Rocky Mountain Conference running back at Colorado College majoring in art history, as well as an avid movie fan, Sabol was, as his father put it, "uniquely qualified to make football movies." Sabol won over 40 Emmys during his time with NFL Films and was honored with the Lifetime Achievement Award in 2003. Sabol took over NFL Films from his father Ed, who founded the company, and instituted several groundbreaking ideas in the world of sports television. NFL Films was the first company to wire coaches and players for sound as well as the first to use slow motion and montage editing in sports. The Broadcast Pioneers of Philadelphia inducted Sabol into their Hall of Fame in 1996. Sabol was married for over a decade to his first wife, Lisa, mother of his only son, Casey Sabol. After their divorce, Lisa married John DeBella. Sabol then married his second wife, Penny Sabol. On September 18, 2012, Sabol died of brain cancer in Moorestown, New Jersey, 18 months after being diagnosed with an inoperable brain tumor in March 2011. He died two weeks before his 70th birthday, and a week after his father's (Ed Sabol) 96th. He was honored before every NFL game in Week 3 with a video tribute. The NFL paid tribute to his life and contributions to the league, at a ceremony on February 12, 2013, in Philadelphia. ↑ Jody L. Bailey (Spring 2006). "The Caduceus of Kappa Sigma, Spring 2006" (PDF). kappasigma.org. Retrieved September 23, 2012. ↑ Tom C. Brody (November 22, 1965). "Brody, Tom C. "The Fearless Tot From Possum Trot," ''Sports Illustrated'', November 22, 1965". Vault.sportsillustrated.cnn.com. Retrieved September 20, 2012. ↑ Briggs, Jeff. "Steve Sabol, President of NFL Films, Dead at Age 69". SBNation.com. Retrieved September 20, 2012. ↑ RACHEL COHEN (AP Sports Writer). "NFL Films President Steve Sabol dies at 69 – Yahoo! Sports". Sports.yahoo.com. Retrieved September 20, 2012. ↑ "NFL to honor NFL Films' Steve Sabol on Sunday". NFL.com. July 31, 2012. Retrieved September 20, 2012. ↑ Barron, David (February 12, 2013). "NFL Films stages a fitting tribute to Steve Sabol". Houston Chronicle. Retrieved February 14, 2013.